Review: It should come as no surprise to people that Supergirl is one of my favourite comic book characters and heroines. In fact the name ‘SuperMarcey’ comes from my love of Supergirl/Superman and Super Mario Bros. It should also be no surprise that when DC decided to reboot their titles that Supergirl was first on my list of comics to get. I had no idea what to expect or what we would be in for. How was DC handling the character, would she still be the same or were we going to get a new Supergirl? This initial story arc appears to be an introduction to this rebooted character and serve as a bit of an origin story. 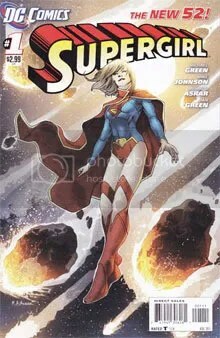 Rather than just introduce her casually (the way Superman was handled in both Action Comics #1 and Superman #1) the story begins with Kara Zor-El crashing to Earth, she doesn’t know what is going on or where she is. She quickly learns she has these incredible powers, but at the same time she finds herself under attack. The first issue serves as an introduction to her as well as her newfound situation. She has just come to Earth, she doesn’t know why or where she even is. Her discovery of powers comes at the right time as she finds herself under attack and begins to learn how to fend off enemies. The second issue shows Kara remembering her last moments on Krypton and she is babysitting her baby cousin Kal-El. Unable to comprehend that just days ago he was a baby and now he is fully-grown right before her, the mystery of what has happened to her is deepened. She does not believe this man in front of her is Kal-El and the two naturally battle. Her self-discovery is continued and we progress with this story. The stage is set for Supergirl, and this story arc should be able to wrap up her origin and introduction fairly quickly. It is handled quite well and it certainly holds interest through these two issues. Supergirl is not quite the same as we had seen more recently, this is all new to her and things are clearly going to change. Speaking of change, her appearance has been altered quite significantly. At first I wasn’t a fan of the new costume or hairstyle, but as I opened the first issue it quickly grew on me and I really like the look. The costume is more of a bodysuit, with no skirt and the cape is quite large. The boots have changed slightly and perhaps they were going for a more practical look. Her shorter hair is nice and I really like this new make over. The series is definitely ones for fans of Supergirl like me, but it also serves as the perfect entry point for her character. If you have ever wanted to discover Supergirl this would be the place to start. The story is handled well; the art is quite fantastic, with Asrar handling both Supergirl and the scenery and fights around her expertly. It is quite a clean art, with hints of ‘messy’ but it just overall works and blends together with the story. Issue #3 will get reviewed soon!